Miller Products Company, an Iowa manufacturing staple for more than eighty years, is leading the charge to build a stronger manufacturing base in South-Central Iowa. A new apprentice program for employees is serving to create a workforce that meets the growing demand for CNC machined products well into the future. Following Department of Labor guidelines and working with DMACC, Miller currently has two employees working their way through the CNC Operator and Programming apprenticeship program. Ed Cook has been a Miller employee for close to two years and was the first apprentice, starting the program in August of 2017. The newest addition is Cody Hager, who started as a temporary employee with Miller a year ago, being hired full-time last summer, and taking on the program just this past January. The CNC Operator/Programmer apprenticeship consists of evening classes on the DMACC campus in Ankeny as well as 2000 hours of practical work and hands-on training. While the classes typically run less than two years, the time commitment is substantial. Participants work a regular full-time shift at Miller before driving more than an hour one way each weeknight for DMACC classes. 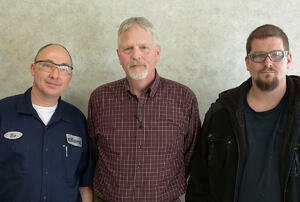 Through their Apprenticeship Program, Miller Products offers a 100% tuition reimbursement incentive. Once the employee has earned their CNC Operator/Programmer certificate by completing the coursework and the practical hours, they can be reimbursed while they continue to work for Miller. This benefits both employee and employer by ensuring Miller has the best-trained staff to meet demand for their products and through creating a solid future of marketability for their employees. For more information about the CNC Operator/Programmer apprenticeship program at Miller Products Company, contact Bruce Herzberg, Plant Superintendent by calling 800-245-7034 or by submitting a message through the Miller Contact Page.